US healthcare “solutions” are the death knell for the NHS – will our politicians save it ? 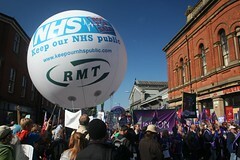 The Health and Social Care Act 2012 marked the end of the NHS in England. But you wouldn’t know it from the election debates, as cries for more funding compete with differing claims about privatisation. Politicians seem to be deliberately avoiding the elephant in the room. What do we have now? NHS trusts struggling with deficits triggered by the private finance initiative (PFI) and reductions in NHS funding.2 A health secretary with no legal duty to provide hospitals, community services, ambulances, and doctors and nurses throughout England. Local clinical commissioning groups (CCGs) with no duty to provide, only to contract and tender in the marketplace—but not for everybody in their area, only for “persons for whom they are responsible” (except for emergency care). Compulsory market tendering diverting billions of pounds of NHS funding to private providers through an inefficient market bureaucracy. NHS trusts prospectively abolished so that all hospitals will become foundation trusts, structurally designed to be 51% NHS and 49% non-NHS, underpinned by Monitor’s licence conditions that require the list of services that foundation trusts must currently provide to be provided only until April 2016. After this, new reduced lists of services will be drawn up.3 And as if that’s not enough, foundation trusts must draw up “patient eligibility criteria.” Since when were NHS hospitals legally required to choose in advance whom they would and would not treat? Since section 103 of the 2012 act. CCGs are reducing the services for which they will contract. Hospitals such as Queen Elizabeth Hospital in Birmingham have referral restrictions on patients coming from outside provider catchment areas.4 GPs will no longer provide home visits to some patients on their lists.5 Across the country, NHS services, including mental health, rehabilitation, emergency care, and elective surgery, are being closed. These reductions and restrictions pave the way for mixed funding arrangements and a gradual shift to private insurance and charges to patients. Simon Stevens, now head of NHS England after his stint in the United States at United Health, knows full well what is in store for us all. In the US, neither health maintenance organisations—nor the accountable care organisations created in the wake of the 2010 Affordable Care Act—are backed by a government duty to provide (like CCGs). They don’t have a duty to everybody, only to their members (like CCGs). Like CCGs, they are not accountable to local residents; and their public resource allocation is person based capitation, not geographic, and doesn’t cover everyone. Under universal healthcare systems, governments ensure that the risks and costs of care do not fall on patients. In marketised systems, contracts require risks to be identified and allocated by contractors and providers. Commercial providers need to be able to decide which risks they will take, which they won’t, and how they will price and select those risks. In healthcare high risk groups are typically older, poor, chronically ill, disabled, or mentally ill. And membership based bodies are by definition not intended to cover everybody. US healthcare “solutions” are the death knell for the NHS. The NHS must be reinstated and 25 years of pernicious marketisation reversed. Hence the need for the National Health Service Bill tabled in parliament on 11 March 2015 with cross party support.14 The Greens, the Scottish National Party, and the National Health Action Party have pledged support. 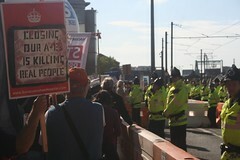 Labour’s plan to remove compulsory commercial contracting (section 75 of the Health and Social Care Act), to cap the profits of the private sector to 5%, and to limit foundation trusts’ income from private patients to 2% of the total are palliative, but they will not halt the terminal decline of the NHS or stem the rot of market models. 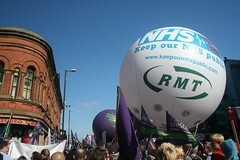 The NHS Bill (www.nhsbill2015.org) would abolish the internal market and contracting, centralise PFI debts, and restore the health secretary’s duty to provide national health services throughout England—as in Scotland and Wales. The question for all election candidates: will they be true to the founding vision of the NHS and support the inclusion of the NHS Bill in the Queen’s Speech on 19 May? Competing interests: AMP and PR are coauthors of the National Health Service Bill. 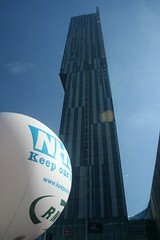 AMP is a founding member of Keep Our NHS Public and a member of BMA Council. For more from The BMJ on the UK general election go to bmj.co/election. Department of Health. The NHS plan: a plan for investment, a plan for reform. Jul 2000. Cm 4818-I. http://webarchive.nationalarchives.gov.uk/+/www.dh.gov.uk/en/publicationsandstatistics/publications/publicationspolicyandguidance/dh_4002960. Barts Health NHS Trust. Annual report 2013-14. https://www.bartshealth.nhs.uk/media/191185/140708%20BHT_AR_2013-14%20FINAL%20LR.pdf. Roderick P, Pollock A. A wolf in sheep’s clothing: how Monitor is using licensing powers to reduce hospital and community services in England under the guise of continuity. BMJ2014;349:g5603. Williams D. Leading trusts defy NHS England over “out of area” referrals. Health Serv J 27 Mar2015. 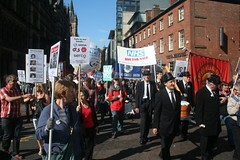 www.hsj.co.uk/acute-care/leading-trusts-defy-nhs-england-over-out-of-area-referrals/5083678.article. Roberts N, Millett D. Out-of-area patient registration could spark funding chaos, GPs warn. GP 21 Nov 2014. www.gponline.com/out-of-area-patient-registration-spark-funding-chaos-gps-warn/article/1322961. Robertson R, Ross S, Bennett L, Holder H, Gosling J, Curry N. Risk or reward? The changing role of CCGs in general practice. King’s Fund, Jan 2015. www.kingsfund.org.uk/publications/risk-or-reward. Institute of Medicine. Best care at lower cost: the path to continuously learning health care in America. Sep 2012. www.iom.edu/Reports/2012/Best-Care-at-Lower-Cost-The-Path-to-Continuously-Learning-Health-Care-in-America.aspx. Himmelstein D, Woolhandler S. Global amnesia: embracing fee-for-non-service—again. J Gen Intern Med2014;29:693-5. Woolhandler S, Himmelstein D. Competition in a publicly funded healthcare system. BMJ2007;335:1126. LaMontagne C. NerdWallet Health finds medical bankruptcy accounts for majority of personal bankruptcies. NerdWallet Mar 2014. www.nerdwallet.com/blog/health/2014/03/26/medical-bankruptcy. NHS England. The NHS five year forward view. 23 Oct 2014. www.england.nhs.uk/wp-content/uploads/2014/10/5yfv-web.pdf. NHS England. New care models: vanguard sites. Mar 2015. www.england.nhs.uk/ourwork/futurenhs/5yfv-ch3/new-care-models. Greater Manchester Combined Authority. Greater Manchester health and social care devolution: memorandum of understanding. Feb 2015. www.agma.gov.uk/cms_media/files/mou.pdf.